Have not been taking much shots lately, but took these 1 week ago. Just thought of sharing it. 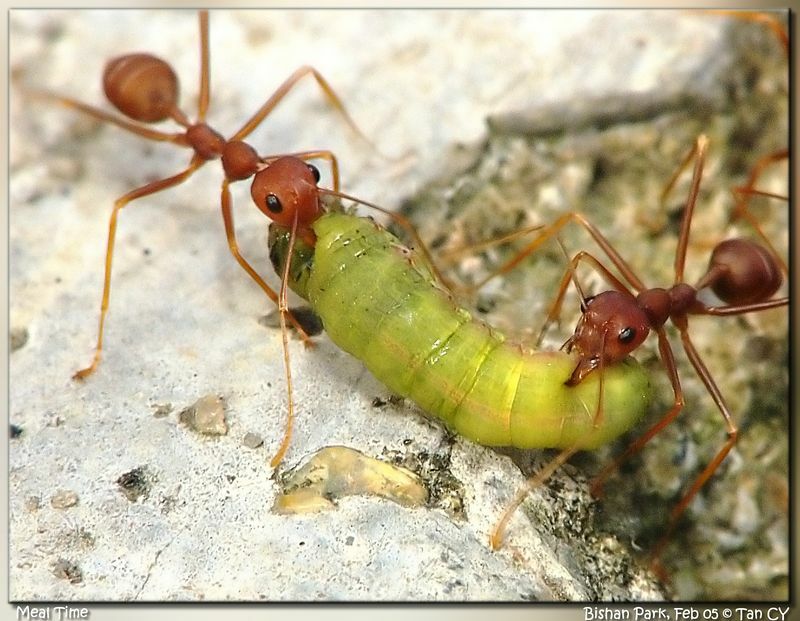 Seems like these ants would really have a juicy lunch! Very nice - how do you get the lettle buggers to pose bribe them? I have tried to take macro shots of ants but those buggers lover to run! It almost seems like the image is a bit soft though, have you tried to sharpen it a bit? are these actors that you hire to model for you ?because that is so lifelike i could swear they were real. ants are ruthless. Glad I'm not a larvae. "butcha ya are Blanche, ya are one!" Thanks all for the comments. The ants were moving it along a path with the caterpillar, so I just followed them and took the pic. I'm no expert to comment, but I would say that this is by far the most vivid and striking macro I have seen in this forum. Excellent clarity, nice focus and above all, great shot!